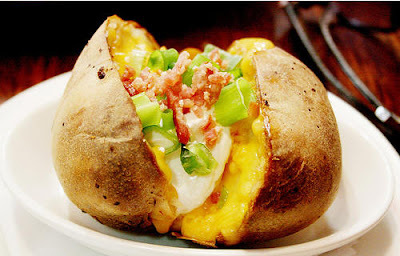 Baked Potato, it may be included in the risky food range since it's baked, which is not considered as a healthy way of cooking in most cases. Risky food is the kind of food that is tasty enough to drive out your previous bad thoughts about them in an instance. Baked potato is just like this. Because you know it will make you fat, it contains too much oil and bad stuff, but when you taste it, you can't drop it. I acturally don't think baked potato is such an unhealthy food like other people thought. If baked in a proper way, and put less oil and salt, it maybe good anyway, since potato itself is a terrific food that has a lot of benifits. There is once a true story about a villiage, where people all live long life, they share the same habit as eating potatos eveyday. There is various way of cooking potatos, the most delicious one I think is baking it. Chinese people often like to fry it, but the slicing process is too hard and time taking. The most healthy way is to use it into making soup, it may keep the nutrition well in the best state.